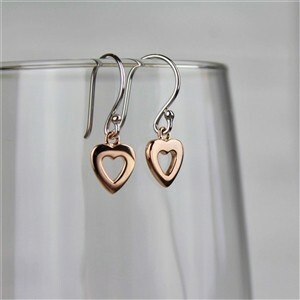 These beautiful rose gold heart earrings are oh so sweet! Presented inside a lovely personalised gift box, they make a gorgeous gift for mum on Mother's day or for that special girl in your life! The little hearts are rose gold plated over sterling silver and hang from a sterling silver shepherd's hook. These earrings come in a stylish gift box which is personalised with an engraved nameplate attached to the lid; we can engrave up to 30 characters, making it an extra special gift.